They were first employed by the Druid Elders of the West, once known throughout the world as the Arya. The name Ireland was originally rendered Ari or Arya Land; one of the main connotations of the term being "Western Land." Another was "Land of the Pure or Noble Ones." Hard as it is for most modern men and women to comprehend, once-upon-a-time the little green land was home to the world's original aristocracy. This fact has not been conceded by the vast majority of Celtic scholars who are for the most part in doubt about where the so-called "Celts" originally came from, and unaware that the term "Celt," as promulgated by Greek and Roman mythmongers, is both inaccurate and prejudicial. 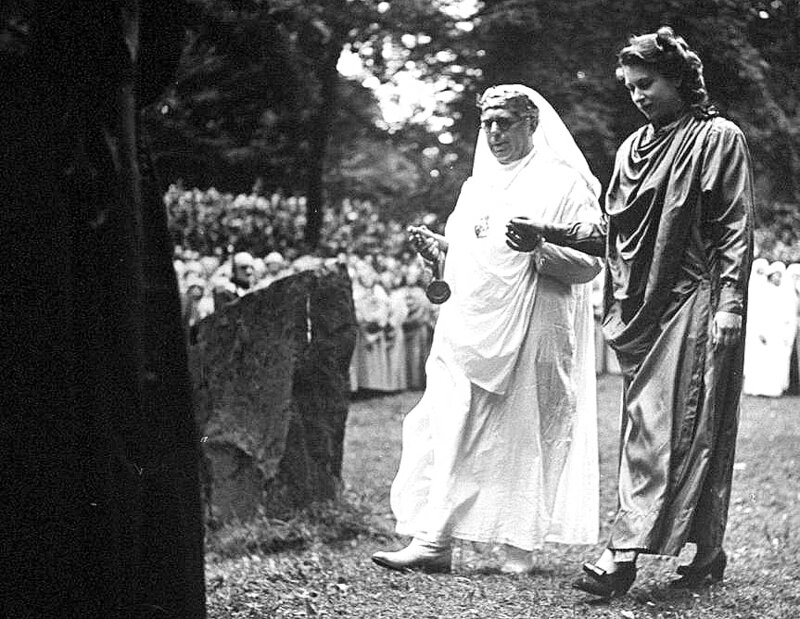 A young Queen Elizabeth with the High Druid during a ceremony. One derivation of the word Druid is dar wydd, meaning "Superior Priest." The pseudonym of the British royal family, Windsor, was adopted from the Druidic Win de Sieur meaning "White Seat" or "White Mount." Of course, modern Druidism is nothing more than Atonism, and a far cry from the original form known in ancient times. I began work on The Irish Origins of Civilization in 2005, and published both volumes of the book in November 2007. My researches into Ireland's role in world history commenced in 1981, after a preliminary study of ancient Irish mythology. As of this date (2018) few of my theories and assertions have been accepted by modern-day writers and researchers. Nor have they been deeply contemplated and correctly tackled by revisionists. Nevertheless, we are in an age when the ideas presented are likely to eventually be corroborated. Recent archaeological discoveries help radically change what has hitherto been accepted about the history of the West. The lies and fallacies concealing the facts about our past are daily being compromised. The elements of modern civilizations originated in prediluvian ages, long before the official dates given for the advent of sophisticated human artifice. After the destruction of Atlantis, the Arctic Homeland, and other prehistoric civilizations (approximately 13,500 years ago), surviving cultural elements were transported to Britain and Scandinavia. Britain was known as the "Fortunate Isles," because it survived the unimaginable devastation that rained down upon Hyperborea (the northern hemisphere). The preservers and disseminators of prediluvian Hyperborean gnosis were the priesthood known as the Druids. This word means Servant or Keeper of Truth. However, the Druids were a worldwide priesthood and were not confined to Western Europe. In Egypt they were known as Amenists. The cosmologies and pantheons of India, Egypt, Italy, Greece and other countries, were not autochthonous. They originated in Britain and Scandinavia. Indeed, a great many characters and events mentioned in the Old Testament, Book of Enoch, and other ancient texts lived and occurred not in the Middle East or Asia, but in Britain. The legends and myths of many eastern lands derive from the West and were in later ages transferred to eastern nations and peoples by disingenuous mythmongers in the pay of imperious potentates such as Constantine the Great. For example, the well known myths concerning Osiris and Isis are of Western origin and were not born from the indigenous races of Egypt. Ireland not Egypt was the post-diluvian cradle of the elements of civilization. It is from Britain and Scandinavia that these elements spread throughout the world. This controversial fact is persistently denied because it inevitably gives rise to speculation about Atlantis, the Age of Catastrophe and antiquity of advanced pre-Adamic humans. Revelations on these subjects devastate fundamental tenets of modern-day science and religion. Additionally, the facts about the widespread influence of British Druidism is largely unknown because of the wholesale destruction of the Druids and the prolonged and deliberate suppression and mutilation of their social traditions and religious leitmotifs. 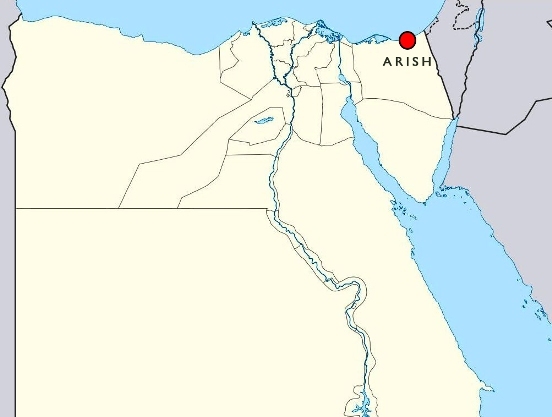 There were primordial connections between Britain and Egypt. Long before the first official dynasties (over 4,000 years ago), Western Arya emigrated to the Middle and Far East establishing new civilizations and enriching existing ones. Their remains have been discovered in Upper Egypt and locations farther east. They were the original architects of the Giza Pyramids and many sacred temples along the Nile. They brought with them the worship of Amen Ra, Osiris, Horus and Isis (the Nordic Is). While in the east the Arya referred to their ancestral Western habitats as "lands of the dead," due to the colossal devastation that occurred there. Even terms such as "underworld," "hell" and "Hades" refer to the West and the devastation that occurred there in prehistory. The many prehistoric and historic emigrations to the British Isles (of Iberians, Celts, Gaels, and so on) were for the most part returns. During the so-called "Age of Catastrophe," titanic cataclysms (following on from those that destroyed Atlantis) displaced the original inhabitants of Britain, forced to flee to the Continent across land-bridges now lost beneath the waves. The Druids were Aryans. This word is usually narrowly conscrued to signify race. However, the term also refers to spiritual caste. It is also the true name of Ireland, correctly rendered Ariland or "Land of the Arya." The term can be correctly rendered Eri, signifying the earth goddess of the ancient Druids. Etymologically, ari and eri are found as roots in terms and names such as area, terra, Tara, Mary, Hera, Benares, Armenia, Aramaic, and aristocracy, etc. Names such as Terah (father of Abram) and the place-name Haran, are Irish. (Haran being synonymous with Aryan.) The epithets Iberian, Hibernian, Hebrides, Hebericum (old name of York), and Hebron, are equivalent to the Latinized Hyperborean, connoting Ireland and the Arctic Homeland. This is the true meaning of Eber (an ancestor of the Israelites), place-name and personal name Heber and Hebrew. The priests of the Nile - the Ibaru - took their name from the illustrious North-Western Arya. As the great Anna Wilkes tells us: "Hyperborea was unquestionably the lands of the Druid and Bard, whose religion was identical with that of the later Hebrews." The very word for a Druid - Bard - is the equivalent of Boreades or Boreas, meaning "north." The Ibaru were but one contingent of Westerners living in the Middle East. Related groups were the Luvians and Shemsu Hor (the Disciples of Horus). Evidence of their presence has been well and truly suppressed. Terms and names such as Israel, Israelite, Jew, Judite, Yahud, Jehovah, Adonai, Aton, Amen, Elohim, Christ, Jesus, Messiah, Joshua, Isaac, Jacob, David, Solomon, Moses, Hiram, Esau, and so on, were originally Druidic or Aryan appellations. Some of these terms were titles denoting senior members of Druidic colleges. These terms were plagiarized and deliberately mistranslated and misassigned to obscure the facts about the origins of religion. The term Levite is a variation of Luvian, which refers to a group of adepts - the Disciples of Lugh - living in Mesopotamia. It is their customs, rites and appellations that we find being later rescripted by the authors of the Old Testament. The term Levite is, as I show, also a reference to the rowan tree, sacred to the ancient Western Arya. Trees such as the rowan and yew (as well as others) were well known insignias of the Arya. Judeo-Christianity is an adulterated form of Druidism and Amenism. The vast majority of tenets, doctrines, terms and symbols of modern religion are the result of deliberate plagiarism. They are based on ancient Aryan theology and astro-theology. Practically every deed and word we see and hear from members of the orthodox branches of Judaism, Christianity and Islam, is designed to conceal these controversial facts. The adulterated form of Druidism and Amenism may be referred to as Atonism. Atonism is the foremost basis for the monotheistic elements found in Judeo-Christian theology. That modern experts foam at the mouth denying this fact does not make it less true. The truth is that Christianity was not conceived by egalitarian Jews or Essenes, Mandeans, Stoics, Therapeuts or Alexandrian Gnostics, as many misinformed researchers and authors assert. Most of these oriental sects were branches of ancient Atonism. The same can be said of Mithraism and Talmudism. The Jewish Jehovah - also referred to as Adonai - is none other than Aton, god of light. The Gaonim have nothing in common with modern religious "Jews." Terms and appellations of this kind do not refer to the kind of sects or beliefs we might at first imagine. They refer to a caste of sorcerers descended from the corrupt solar cults (or Luciferians) of antiquity. Members of the British royal family are Judites, even though they belong to the Protestant religion. The Pope and his bishops and cardinals are likewise Judites, even though they belong to the Catholic religion. The word Tudor derives from Juda or Judah, as do the terms judge, tutor and Teuton. These facts are known to members of Masonic orders and other Judaic-Atonist enclaves. To them religious affiliations mean little and are merely a form of camouflage which serves to dupe the world's uninformed masses. Akhenaton's Atonists were members of the Hyksos nobility or so-called "Shepherd Kings." However, in my opinion these controversial kings were of Scythian (or Gaelic) ancestry. In other words they were from the West. During and after the Age of Catastrophe, their ancestors (the pure Arya) fled from Britain to northern and eastern Europe, and from there further eastward toward Syria, Palestine, China, Japan, Pakistan and India. Although the Scythians were originally affiliated with the migrating Megalithic Arya, some of their number became spiritually and morally corrupt. Today, a few mainstream historians and archeologists hesitatingly accept that Western "Celts" (as they are erroneously called) had settlements in the Middle and Far East. This is because these emigrations were relatively late, historically speaking. They date from approximately 600 years BC onward. Modern academics dare not accept or acknowledge earlier Megalithic emigrations from the West to the East. As we said, this idea leads to a plethora of vexatious questions that "experts" habitually and contemptuously ignore. The exiled Hyksos-Atonist-Setians did not disappear from the world and did not spend any time in "Captivity." They were a super-wealthy pharaonic dynasty with powerful connections throughout the world. After the fall of Akhenaton their descendants regrouped in Lower Egypt, with the elite branch eventually emigrating to their ancestral homes in the West. Their objective was to establish a new empire. They were successful. From Britain they exercised control over their many loyal deputies in Athens, Rome, Tanis, Alexandria, Judea and elsewhere. The British Empire is unquestionably the Atonist empire upon which the sun (Aton) never sets. (The Union Jack is in fact a symbol of the Union of Jacob.) The empire's founders and maintainers have unleashed untold mayhem for centuries and have caused unfathomable suffering throughout the world. My work is dedicated to the exposure of these psychopathic plutocrats and the ruin of their antihuman industry. Until this Black Lodge is correctly identified and destroyed, common or garden political activity and civic reform will prove ineffectual. The return of the Hyksos-Atonists to the West was recorded in Irish and Scottish annals. These refer to the invaders as Milesians, after their leader King Mil (known to the Scots as Gathelos or Gaythelos, which is probably were we derive the term Gael, meaning "stranger.") Officially the Milesians are believed to have crossed over to Ireland from Spain around 600 BC. However, I believe these dates have been deliberately falsified. The Atonist invasion probably occurred nearly one thousand years before the official dates given. The falsification occurred because historians have been directed to date the Gaelic invasion of Ireland, suppression of the Druids and creation of Christianity to the period following the rise of Rome (700 BC), not before. As I said, the ancestors of the Milesians (the Scythians) were originally Irish. Long before the time of Akhenaton and the Atonists, they had been displaced to Europe and the Middle East after experiencing the havoc of the Age of Catastrophe. Members of the British, French, German and Swiss Merovingian dynasties were and still are Setian-Atonists. 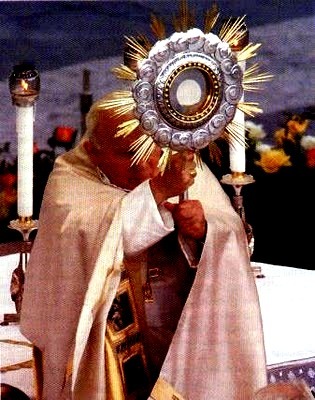 Powerful secret societies such as the Order de Sion, Knights Templar, Freemasons, Rosicrucians, Illuminati, and so on, are funded and operated by elite royals (and other elusive entities, such as the Roman Circle or College of Cardinals), whose shadowy members are either biologically or ideologically related to the Setian-Hyksos-Atonist-Judites of antiquity. Members of these groups are "Luciferians" or "Princes of Light." The modern-day architecture of control and so-called "New World Order" is the brainchild of Setian-Atonist autocrats and demigods whose existence I expose throughout my work. The majority of the symbols permeating the corporate and religious world denotes this cult of Luciferians. Their "New World Order" is a architecture of control designed to replace the "Old World Order" lost to them in ages past. This cult of sorcerers - the Gaonim or Exilarchs (the Princes and Brothers of Light, or of Aton) - exercise control over humans politically and theologically. The religions they have spawned serve to control man's emotions and pacify his rebellious spirit, while their political orgs offer him a semblance of superiority and power. Tantalized with chimeras of positive social change and technical progress, and blinded by the "light of Aton," man remains psychologically arrested. Consequently, he presents no threat whatsoever to the Establishment figures who habitually treat him as a disposable pawn on their geopolitical boardgames. The architects of control are not scions of some indefinable "mystery religion," as many Christian conspiracy buffs allege. They are initiates of secret fraternities created by the same Black Lodge responsible for the establishment of the Christian Church. Therefore, Christians who seek to expose the workings of secret societies are largely ignorant of vital facts concerning their own allegiances. They are handicapped by not knowing that the very religions to which they belong were established and financed by the same Atonists who fund and direct the secret societies. The Atonists have cunningly divided society in order to pit one misinformed faction against another. While the "opposames" witlessly ride their seesaws, the Atonist presence remains concealed. Nevertheless, the Judaism, Protestantism, Catholicism, Zionism, Islamism and Masonry known today are "brands" manufactured by the Atonist "corporation" or Black Lodge. Therefore, only those free from political and religious bias can successfully combat the nefarious intelligence that has preyed over mankind for so many ages. One day soon the world will finally realize that high civilizations existed in the North-Western hemisphere prior to the tenth millennia BC, and that the knowledge man has gained in recent ages is but a paltry recapitulation of prediluvian wisdom. Unbiased and open-minded "experts" within the academies of the world may soon agree that the elements of civilization germinated in Western lands, and that there were in remote ages relationships between Western and Eastern nations. They may finally acknowledge the facts about the true origins of Judaism and Christianity and shed light on the sinister Atonist cabal that has long directed the operations of the Western world's religions and governments. We can but hope. I believe that members of eastern enclaves were not the only men in cahoots with the Setian-Atonists. Members of elite families in Western lands, such as Vespasian, Titus, Claudius, Poppaea, Constantine, Theodosius and Justinian were I believe also seduced by their power. Several members of the Flavian dynasty of Rome, for example, rose to power because of their allegiance with the descendants of Akhenaton. The actions of these men were directed and funded by the powerful Black Lodge of Setian-Atonists whose existence has been largely unknown to the public until now. These few remarks and quotes indicate that most impressions about the relationship between the "invading" Romans and conquered Israelites must be revised. A lot ore was going on than is generally conceded. In fact, the Roman armies were first invited to Judea by the kings of that land. For most of the 130 years Roman presence Judea flourished materially. During this time a large demographic of Jews lived in Rome and other parts of the empire, doing very well commercially. Indeed at this time Jews made up the majority in the city of Alexandria, the second most important city in the world after Rome itself. The Romans did not suppress the native religions of any people they conquered or ruled over. 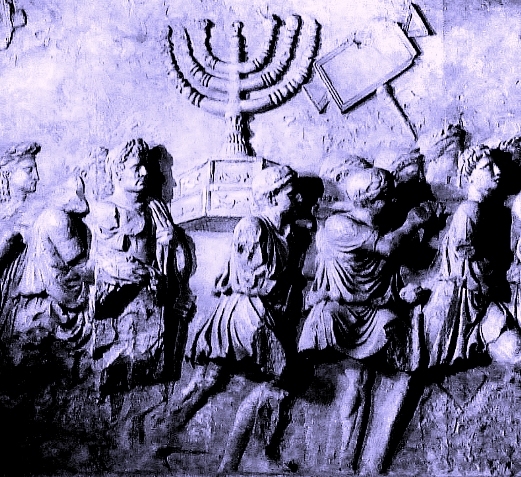 As I maintain, there were even deeper connections between highly placed Jews and Romans. Jesus as presented in the New Testament? years ago, Heliopolitan priests believed in the One God. Although the priests of Aton were monotheistic, Atonism itself was a corrupt version of earlier sacred traditions. The theology was built on the age old foundations of Amenism and Druidism. 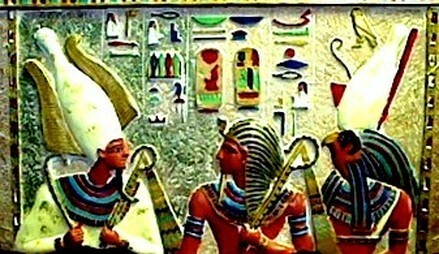 The facts about the Amenists and Druids have, however, been deliberately obscured by the ideological descendants of the Atonists who have funded and directed so-called "historians" to skew the facts about Egypt and Ireland, and distort the meaning of many important terms and titles. One of the most misunderstood and misapplied titles is "Aryan." Its origins are much more interesting than we might at first imagine. To this day Ireland is known by the Gaelic appellations Eire and Erin. But where do these terms come from? In fact, they refer directly to the primordial goddess Eri or Ari. Therefore, the syllables either denote or connote the goddess after whom Ireland was named. In many cases, wherever roots such as ari, ara, eri, and so on, are found, they connote or denote the land of Ireland specifically or, alternatively, the Western hemisphere. They signify men of the West, as well as their sacred land and beloved goddess. As to the original homeland of the Arya, we take the view of researchers Ignatius Donnelly, Anna Wilkes, Conor MacDari and Comyns Beaumont, who stressed that the ancestral habitat of the Arya lay in the West. Donnelly specified the lost prediluvian continent of Atlantis, and we agree wholeheartedly with his assertion. The lands of the North-West (namely Britain, Scandinavia, Iceland, Greenland, and perhaps even the Arctic climes) are in my opinion remnants of lost Atlantis. There is ample evidence for this, although the facts have long been suppressed by academics who would rather that vexatious questions about man and his true history are never sufficiently answered. This same group of elders were known in Egypt as the Amenists. The world is unaware of the existence of prediluvian civilizations for the simple reason that they no longer exist. As the majority of myths and legends tell us, the continents that housed them were destroyed by violent cataclysms. And this premise is now scientifically confirmed. Evidence exists to show that between 10,000 and 13,500 BC our planet was wrecked by a natural cataclysm of unimaginable proportions. The devastating catastrophe was recorded by numerous tribes and nations, and is mentioned in the earliest Irish legends. Due to its disruptive geospheric effects, the earth suffered subsequent upheavals. Significant disasters (tsunamis, earthquakes, volcanoes and century long droughts and famines) shook the world at 8,000, 6,000, and 3,000 years BC. The Mycenaean Drought, the eruption of Thera in the Aegean, the Storegga Tsunami of Scandinavia, the rise of aridity throughout the Sahara region of North Africa, the rise of the waters of the Mediterranean, the dwindling of the vast Saraswati River in the Indus Valley in Pakistan, and the prolonged Bronze Age famine of Britain, are just a few of the super-catastrophes known to have occurred at different periods after the original global "Age of Catastrophe." Legends from all over the world, which tell of the fall of the prehistoric continents Atlantis and Lemuria, record a real and exceptionally traumatizing episode in humankind's history. I dealt with the great catastrophe and subsequent trauma to consciousness in Atlantis, Alien Visitation and Genetic Manipulation. Simply substitute Irish or Scots-Irish for "Phoenician" and the webs of deception spun by mythmongers melt leaving the truth about world history brightly shining forth. Indeed, later descendants of the prehistoric Phoenicians turn up in Ireland as the better known Fianna or Fenians, a term still designating native Irishmen. The syllable Finn means fair and fine. (See Fionn, Finland, etc.) Images of Phoenician ships have been found inside the giant cairn of Newgrange, County Meath. Proof that a supremely educated elder race of adepts lived for extended periods of time in Northern Europe and Asia is made evident from a study of astronomy. Astronomically, certain cycles of luminaries, planets, stars and constellations may only be observed and noted from specific locations on earth. These various sidereal cycles are of such immense duration that they simply cannot be reckoned by any tribe or nation not geographically stable for an extended period. In short, the exceptional class of men responsible for precise astronomical calculations, and resident at the requisite geographical location, were the Megalithic Irish and Nordic elders displaced to Europe and Asia from shattered Western habitats. They were the Hyperboreans or Atlanteans, and it was they and their descendants who were the world's first master astronomers, astrologers, geomancers, and cyclopean monument designers. 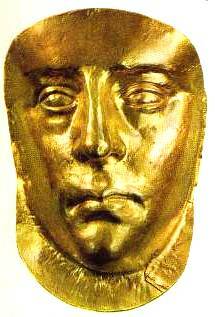 Death mask of a Scythian queen. Note her handsome Caucasian features. As I show in Volume One - in the chapter on the Milesian invasion of Ireland - ancient records inform us that the Celtic or, more correctly, Gaelic Scythians of Europe were closely allied with the Egyptian nobility of the Delta region, those same Hyksos. Old Irish annals refer to the descendants of Scythians who lived in Egypt as "Milesians." This name was taken from their chieftain Mil or Mile, known to the Scots as Gathelos. The vast majority of British historians prefer to deal with the Milesians after their vacation of Egypt. They concentrate on the Milesian conquest of Spain and avoid dealing with historical anecdotes that speak of their time on the Nile. This omission alerts us. Nevertheless, when the dots are connected a fascinating story comes to light, not only concerning connections between ancient lands and peoples, but the origins of the world's premier secret societies and their so-called "New World Order." In my opinion the so-called Scythians of Europe were the people Egyptologists refer to as the "Hyksos" nobility of Egypt. 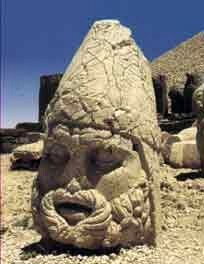 The Hyksos were identical to the so-called Israelites of the Bible. If my Scythian-Hyksos connection is correct, then we have from the annals strong confirmation of the West to East transit of the elements of civilization. Furthermore, we can offer a more logical explanation for the word "Saxon," and why some researchers believe Saxons and Israelites to have been one and the same. Some investigators believe the word Saxon to be a derivation of Saca (or Saka, Sakai, Saga, Sage, etc) denoting "Scythian." Allegedly this word gives us the name Isaac or, more properly, Ish Sac, meaning "Man of the Saca." According to the Old Testament, Isaac was the son of Abraham who was, along with his wife Sarah, the first "Israelite" to enter the land of Egypt. 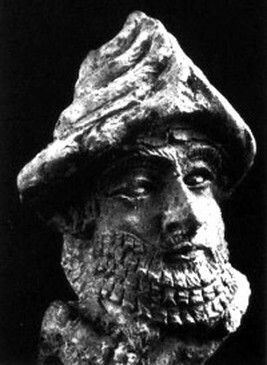 The name Isaac indicates that Abraham and his descendants were Scythians. I think this likely, although I am cautious when consulting official accounts concerning this prophet and his spurious emigration. There is much more to the saga than we find in the Old Testament account. In any case the etymology suggests that the Scythians were indeed one and the same as the Hyksos nobility. Therefore, it follows that the Scythians were the Biblical Israelites. Additionally, the etymology suggests that the so-called "Anglo-Saxons" were descendants of the Scythian-Hyksos-Israelites. The Scythian settlement of Scythopolis, a stone-throw from Jerusalem. Place names, such as Galilee, Golan, Samaria, Jordan, Sumeria, Saqqara, Sahara, Gadara, Arabia, Armenia, Iran, Syria, Mallewi, Amarna, Tyre, and Tarim, etc, betray Irish roots and the presence of the Scythians and earlier Arya - the men of the West. Another name for the Scythians was Ashguza. The syllable ash may refer to the ash tree, and the syllable guza to Goth and to goat. Personally we think it likely that the Scythians were connected not only to the Hyksos but Cretans, Mycenaeans, Philistines and Amorites of Mesopotamia. We also believe Aryans from the Western hemisphere traveled into eastern Europe and Asia long before the time of the Scythians. We believe the Scythians were among those displaced to Europe from Britain and Scandinavia after the Age of Catastrophe. It was a corrupt but powerful warlike group that decided to make their way to Egypt during the thirteenth dynasty. Official history accepts that the Scythians (under the pseudonym "Sarmatians") were used as mercenaries by the Romans during their conquest of Britain. However, this is a half-truth. In fact, it was the Scythian-Sarmatians or, more correctly, Atonists, who employed the Roman army as mercenaries. The Scythians had been a power in Eastern Europe and the Middle East long before the rise of Rome in 700 BC. The great patrician families of Rome were under the control of the secretive high-level Atonists from the beginning. Historians in their employ deliberately inverted the true story about the Roman-Scythian connection. Caucasian mummy found in Cherchen, China. Regardless of whether the Western Goths were related to or descended from proto-Scythians or earlier Aryan emigrants, they succeeded in reaching Egypt, India and China. Recent archaeological evidence shows us that fair-skinned Westerners made homes along the Indus Valley in Pakistan, in the Indian Kush, and in China's Cherchen region and Tarim Basin. Examinations of the hair, clothing and accoutrements of long buried men and women in these far eastern locations clearly identifies them as Nordics from Denmark, Norway and Sweden. The Jats (elite Sikhs) of Northern India may be an late offshoot of the Arya. Or they may be the descendants of later Scythian emigrants. This much is confirmed by the Sikh historians and Sikh people who have always maintained their that race came to India from the West. Likewise, the Yuezhi of China appear to have a connection to visitors from the West. Were the "Aryan" warrior Sikhs of Northern India descended from nomadic Scythians or from earlier visitors from the Western hemisphere? Their own history claims this to be the case. Their physique, physiognomy, bearing and general temperament is certainly akin to that of ancient Vikings and Goths, that is, of Nordics. 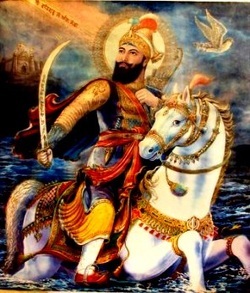 The very name Sikh may derive from Sac or Sakh, denoting Scythians. Sadly Westropp and many other authors who analyzed the symbolism of the ancient races, believe the "Jews" to be the same people as those known by that sobriquet today. Those who have not bought into the propaganda and who have dug deeper, know this is simply untrue. 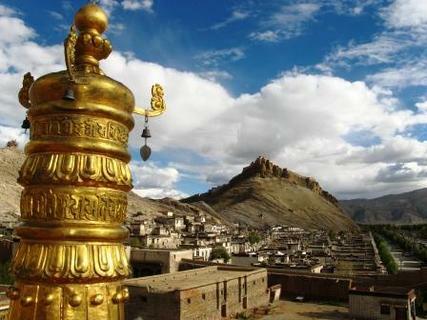 Lhasa in Tibet. The syllable "asa" is a Scandinavian word meaning "gods" or "holy ones" (as in Asar and Aser, etc). Until the seventh century the original name of the city was Rasa, said to mean "place of the Goats," i.e., the Goths. The evidence revealing the presence of the Arya in Eastern Europe, Egypt, Asia and the Americas has been suppressed. The powers-that-be do not want the true origins of civilization to be widely known. They have seen to it that questions concerning the West to East migration of the elements of civilization are never broached by academics. Instead of the truth we are forced to ingest irrefutable errors. However, many perceptive researchers, not willing to fall into lockstep with the official consensus on history, have seen through the smokescreens and disinformation. Their discoveries provide us with insight into all that has been hidden from view when it comes to prehistoric emigrations and the connections between ancient peoples. 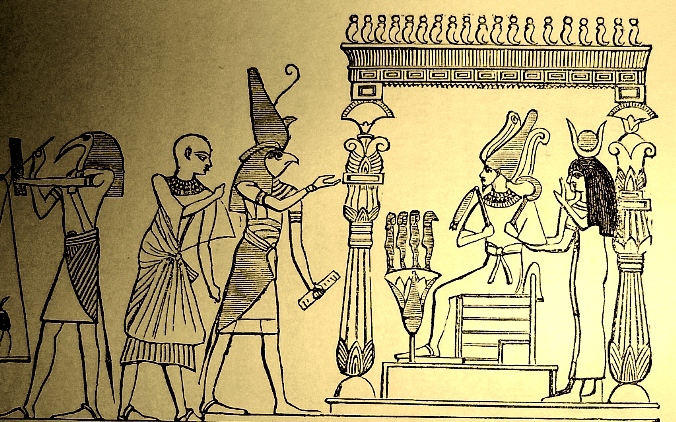 Osiris enthroned and in the process of judging a soul as he passes through the underworld on its way to Amenta. The name Osiris is not a correct rendering. The god's name is Asir, Asar or Asari. Even more correctly, he is As Ari - Lord of the Arya or Pure Ones. The syllable sar means "white" or "light skinned," in Akkadian and Chaldean. It is the origin of words such as Shah, Shaka, Pasha, Kaiser, Sir, Sire and Tsar, etc. 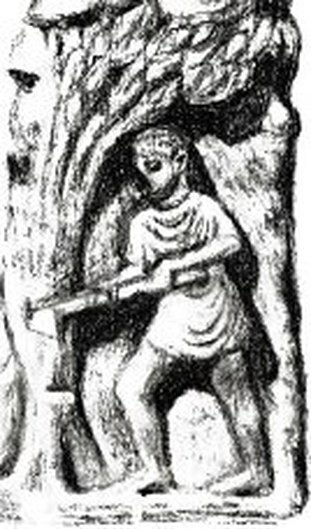 In Nordic languages the Asar are the tutelary gods, same as the Etruscan Aisar. In Persian zar means "old." The supreme god-man of the Persians is Zarastrustra. The Ash tree (Yggdrasil) is the tree in the land or garden of the Nordic gods, in Asgard. Consider also words and names such as shaman, Sarmatians, Saraswati, Sarah and Zarah, etc. We see Asari holding the flail and sickle (or lituus). These two objects mean many things, but primarily symbolize the earth and royalty. They are also associated with the Western Druids. The majority of images of the pharaohs depict what appears to be a shepherd's crook. However, in this more revealing image from the Book of the Dead, we clearly see the sacred sickle identical to that employed ritually by Western Druids. As Osiris was god of the earth, agriculture and vegetation, it certainly makes sense to see him holding the sickle for reaping and flail for winnowing. As of 2010 the truth begins to shine concerning the Western ancestry of the pharaohs, specifically those of the famous eighteenth dynasty. Tutankhamen's DNA turns out to be of Western origins (Click here for 2010 report). Given the new found facts, the question arises as to what we are to make of all those aggressively publicized efforts to de-Westernize the ancestry of Tutankhamen in order to present him as a negroid pharaoh. What are we to make of the highly profiled theories of United Nations backed charlatan Cheikh Anta Diop and his school who have labored to convince the world that Egyptian civilization was the brainchild of Black African kings? 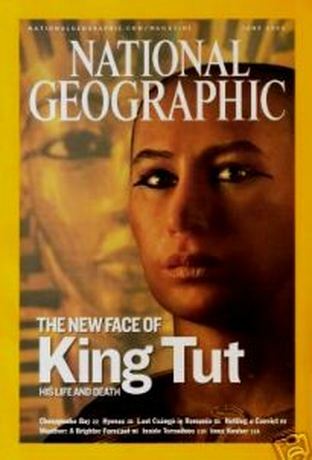 Note, for example, the scandalous cover of National Geographic magazine with the title "The New Face of King Tut." Now perhaps scholars can make more sense of the Irish-style knotwork and golden torcs found in abundance inside the tomb of Tutankhamen; torcs identical in design to those made in Ireland for ancient kings. For more hard evidence of the presence of Arya in the east, see Appendix II: Recent Discoveries Confirming Western Origins of Civilization. 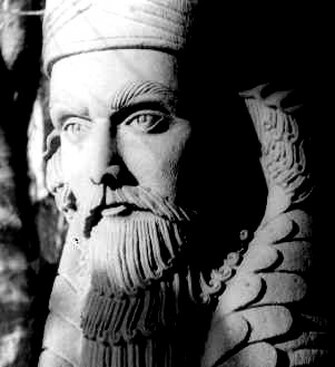 Two ancient sculptures of Ahura Mazda. The Nordic features are most distinctive. The word Mazda means "knowledge" or "wisdom." The word Scythian derives from the root Saca, from which come words such as sacred, sacrament, sage, saga and stag. The root is most likely a variation of a word referring to the stag god of the ancient Irish. This stag god is also known as Cernunnos or Herne. The word Zak or Ztakh means "stag." A pseudonym for the Scythians was Scuts, which can also be rendered Scots. Horned animals such as the stag, goat and ram were sacred to the Scythians, Goths and Druid elders of Western lands. The images of the male stag and female hind can be found on many coats of arms and on the heraldry of many old and illustrious families. obliterated throughout Britain and Europe. Above left we see a photograph of a Nordic-type male with blond hair and beard. He has been burned red by the sun. In ancient days when men from the West arrived in the Near East or Asia, on ships or on horseback, with their piercing blue eyes, tattoos and copper jewelry, they were taken for gods and referred to as "red men." This is rendered "Edomite" in the Bible. Greek historians knew that the mystery school of Pythagoras was actually inspired by a Western Scythian known as Abaris, a name that should probably be rendered Ab Ari, meaning "Great One of the Ari or Arya." In any case, Abaris was clearly a Western adept. The words abbe and rabbi (meaning "priest") come from the same root as Abaris. More significantly, the word rab means "west" or "western," revealing that the original rabbis and Levites were related to the Western Aryan priesthood. As stated above, we believe that a contingent of Western Scythians were at one time close allies of the Egyptian Atonist-Setians. Indeed, there is reason to believe that these Scythians were the Atonists of Egypt. Because Atonism is the root both of Judeo-Christianity and Freemasonry, it does not surprise us to see Masonic Orders such as the Knights Templar employing symbolism that connotes Scythians and Setian-Atonists. 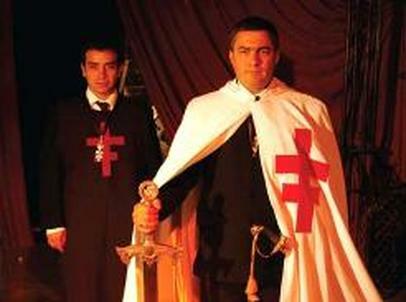 Members of the Spanish branch of the Knights Templar. 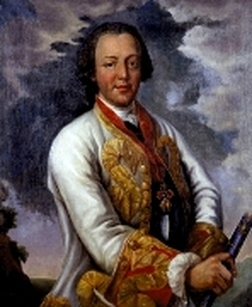 Note the white tunic and red double cross motif. In my estimation, the very insignia of the Templars (two knights riding a single steed facing West) commemorates the Scythian-Hyksos or Scythian-Atonist blood bond. 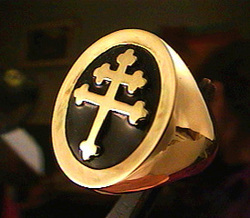 The so-called "Double Cross of Lorraine" appears to us to be another prominent Masonic emblem connoting the same tryst. Interestingly, Charles de Lorraine, of the French House of Lorraine, was apparently the main patron of Adam Weishaupt and his Illuminati. 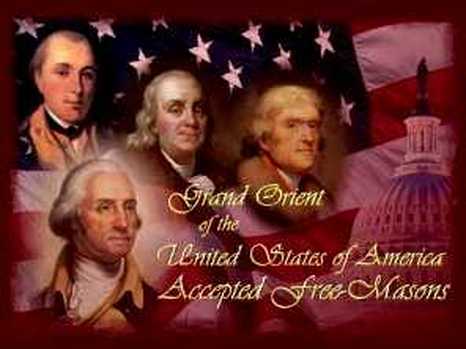 Weishaupt's political and social ideologies are known to have influenced American presidents John Adams, Benjamin Franklin, and Thomas Jefferson, as well as many other influential personages throughout the world. Illuminist or, more correctly, Atonist emblems appear on American bank notes and in the architecture of most towns and cities. Interestingly, Benjamin Franklin's code name was "Moses." His personal design for the American one dollar bill depicted the Israelites leaving Egypt during their Exodus. Charles de Lorraine was patron of the Illuminati. Researchers who imagine that the Illuminati were anti-royalist are grievously misinformed. Although this is the impression the secret society's elite members attempted to generate, it is anything but the truth. European royals were, and still are, the power behind the world's prominent secret societies. Their interests have never been the overthrow of orthodox religion or monarchy, or the liberation of humanity. This idea existed only in the mind's of gullible, misinformed lower rank members. Emblem of the Knights Templar: two knights riding a single steed facing Westward. Although many ridiculous explanations regarding this strange symbol have been proffered forth through the years, we believe the emblem represents the age old Scythian-Hyksos, or Scythian-Atonist alliance, that is the ancient confederation of Gaels from Europe with Egyptians of Lower Egypt, as mentioned in early Irish chronicles. 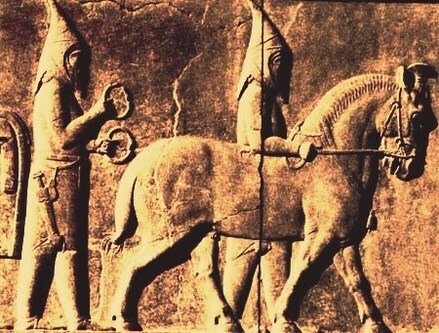 The horse was a seminal symbol for the Scythians. If the Scythians were the Hyksos, or allied with them, then they were surely Atonists. After entering Egypt as welcome scholars and mercenaries, they married in with the families of prominent Egyptians, such as Pharaoh Akhenaton. This much is confirmed by the Irish and Scottish annals. After the removal and exile of the demented tyrant Akhenaton, the Atonists moved Westward toward ancestral habitats. The coming of the Atonists to Spain and Ireland was recorded in histories dealing with the "Milesian" invasion of Ireland, allegedly dated to approximately 600 BC. 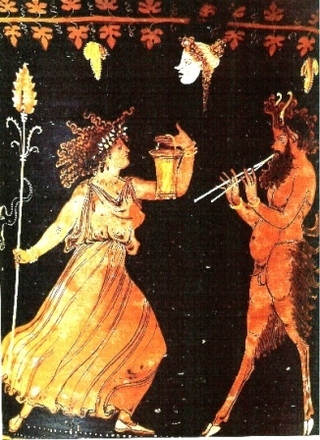 The Milesians were referred to as Gaels, which traditionally means they were "Celts." The term Gael allegedly derives from the Scottish version of King Mile's name - Gathelos or Gaythelos. Their ancestors in Ireland were the Megalithic Druids who were in my estimation close allies of the Egyptian Amenists. This made the Druids rivals to the Atonists or Milesians. And this accounts for why we read of the antipathy that quickly lead to all out war between the Druids (Megalithic Irish) and the Milesians. (See Volume One for more on this subject; the chapter entitled The Atonists Arrive). The Cross of Lorraine is also referred to as the "Double Cross." We believe it connotes the alliance between ancient Atonists, preserved to the present day by the world's royal dynasties and major secret societies. Atonism is the root of Judeo-Christianity. It may also signify Jesus and Akhenaton - that is, the Christ and the Christ before the Christ. The trefoil motifs are a throwback to Druidry. 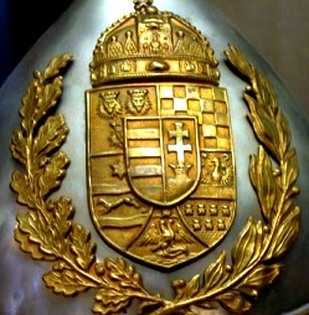 A European Coat of Arms bearing Druidic oak leaves (13 on each side), Masonic checkerboard, lion heads, Druidic 3 bars, Double Cross of Lorraine, Atonist phoenix, and Atonist crown with pyramids. That the design is encompassed by Irish oak leaves is most suggestive. Former internet homepage of the Grand Orient Freemasons of America. Apparently they are happy to emphasize that their members included American presidents and Founding Fathers, and that they are still an influence at the White House. The truth about the origins of Israel and the so-called "Israelites" is covered at length in the Irish Origins of Civilization books and program. This word Israel is made from three syllables: Is, Ra and El. Each syllable appears to refer to the three great Cults of antiquity, namely, the Stellar, Solar, and Saturnian Cults. However, the fusion of syllables may also refer to the alliance between Scythian-Atonists and Hyksos-Atonists. The origin of the syllable "Is" could be Iesa or Esa, sun god of the ancient Druids. The syllable "Ra" may refer to Amen Ra, who was the sun god of the ancient Egyptians. So, the word Israel may be a fusion of the names of two important sun gods. In this case the suffix "el" may mean "messenger of" or "servant of." An Israelite then would originally have been a messenger or agent of Esus and Ra. The word Israel indicates that there were indeed connections between the Amenists of Egypt and the Druids of Britain and Scandinavia. In the Book of Genesis (Chapter 32, Verses 27 to 28), we read that the Israelite Jacob (the son of Isaac and grandson of Abraham) was renamed "Israel" by the Lord. Genesis also tells us that his elder twin brother was named Esau. Esau was also named Edom, meaning "red one." In fact, this Esau is, according to the Old Testament, the ancestor of the so-called "Edomites." In any case, can we surmise the name Esau to be Celtic (Scythian) in origin? Is it a rendering of Esus, the great lord of the Gaels, Goths and Arya? Interestingly, the Book of Genesis describes Esau as a adept hunter. And that description certainly harkens back to Esus and to Herne, the animal and forest gods of the Western elders. The story of the twin brothers, Jacob (Israel) and Esau, appears to be taken from earlier myths of pagan peoples. The version of their story that appears in the ex-canonical Book of Jubilees is strongly reminiscent of the Egyptian story concerning the conflict between the twins Horus and Set. The word Horus can be rendered in many ways. It can be found as Horos, Heru, Hor and Ha. The word means "boundary" or "circle." Astrologically it referred to the horizon, the boundary over which the sun god passes daily and yearly. The words hour, horizon, and horoscope come from the name of the Egyptian sun god. 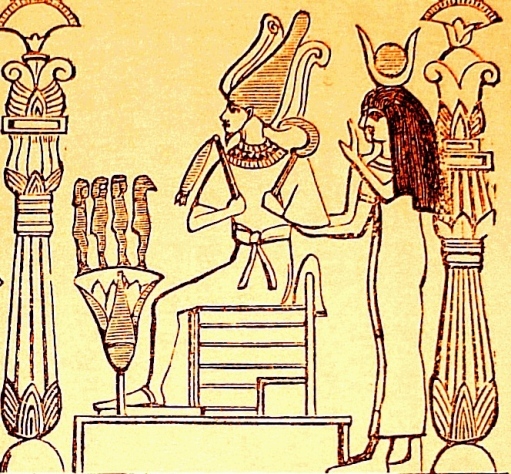 An ancient pseudonym for Horus was Iusa or Iusas. When the letter "I" is translated as "J," we have Jusa or Jusas, from which we derive Jesus. The Biblical Son of God, therefore, was based on the Egyptian sun of heaven, who was in turn a version of the earlier Druidic sun king. Esus turns up in the Old Testament as Esau, the eldest son of Isaac, and in the New Testament as Jesus, the god-man hanged on a tree wearing a crown of thorns. These symbols, and others, have been abstracted from much earlier mythic motifs known to the ancient Arya of the West. 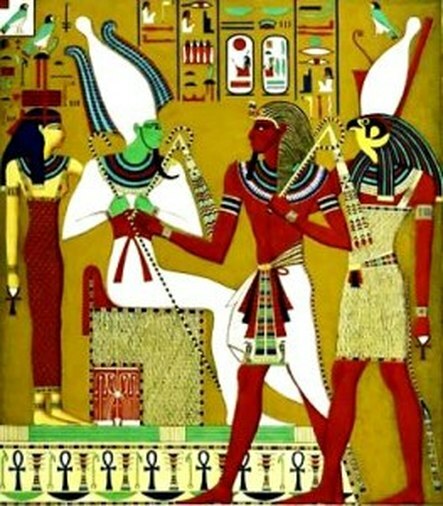 LEFT: Horus leading the "dead" to everlasting life. 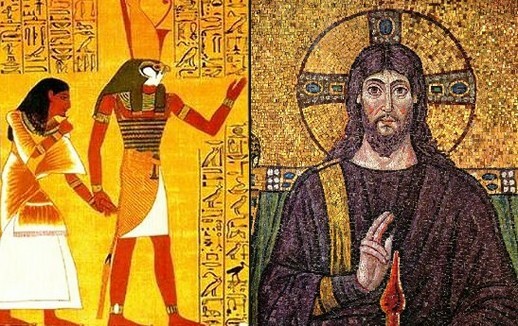 RIGHT: The "Aryan" Christ/Iusas/Hesus/Iesa. The name Jesus is obviously a derivation of Iesa, as is the Egyptian name Iusa or Iusas. The letter "J" was interchangeable with "I." This was the case with the words Jew and Judah. The elites of today's world have empowered themselves by way of the ancient knowledge appropriated from the high traditions of the Arya. As we show above, and as we will continue to show, the symbols, and icons and idioms that have been employed by eastern peoples (Sumerians, Egyptians, Israelites, and others) derive from the Druidic canon. They derive from the stellar gnosis studied to perfection in Ireland and transported by the Druids throughout the world. These early travelers stunned the tribes they visited. The ancient nations knew and respected the Druids and many people, in search of truth, flocked to their colleges. 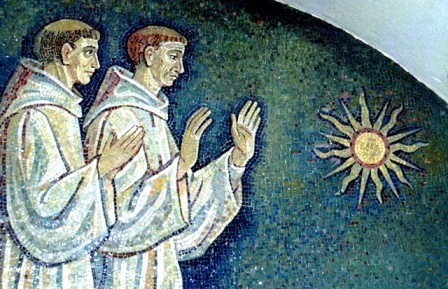 Of course we are not told anything about the Druidic origins of Judeo-Christianity by the sanctimonious mythmongers whose deliberate and calculated misinterpretations serve to undermine the reason of Christians and Jews, thus preventing the true foundations of religion from coming to light. The mythmongers ensconced in Britain and Rome inverted the true story concerning the origins of religion. Their ideological descendants continue the work of deception. The elements of civilization, they falsely contend, first moved from the eastern to the Western hemisphere. There can be no sanity in this world, politically or spiritually, until this lie is dashed and the true facts brought to light. According to the rather bizarre and improbable story, the ten Israelite tribes, after their release from captivity in Babylon, decided not to return to their beloved holy city of Jerusalem that they had been so long in building. Instead, they decided to move West. Allegedly, they followed their leader Jeremiah and crossed the Caucasus Mountain ranges into Europe. These so-called Israelites were apparently known as the "Sons of Isaac." This term was also rendered "Isaac's Sons" and, later, as "Saxons." Therefore, the British-Israelite pseudo-historians have decided that "Anglo-Saxons" were originally "Aryan-Israelites" from Judea and Palestine. This may be true but, historically speaking, the emigration of these so-called Israelites occurred in relatively recent times. So much had been going on in previous centuries when the men who truly and deservedly bore the titles "Israelite," "Judite," "Jew" and "Levite," walked the earth. Modern teachers have warily chosen to refer to early epochs as "Mythological Cycles." They dismiss them and concentrate attention on relatively recent historical times and events. In my work I explore the unadulterated meanings of the problematic terms Jew, Judite, Levite and Israelite, and explore the true origins of the names Jehovah, Yahweh, Adonai and Elohim. The truth is that the so-called "Israelites" of the Old Testament were in fact wealthy pharaohs in Egypt. Investigations made in the last decade and a half, into the ancestry of the "Jews" have conclusively proven this to have been the case. Recent research has served to uncover scandalous mythmongering and misuse of terms, titles, and words. Thanks to authors Ahmed Osman, Mustapha Gadalla and Ralph Ellis, many key historical theories of earlier men of genius (Sigmund Freud, Karl Abrahams, Immanuel Velikovsky, Comyns Beaumont, Conor MacDari, and others) have been confirmed and reinforced. In short, we now know the true identity of the misnamed "Israelites" and "Judites" - the so-called "Twelve Tribes." We know that once-upon-a-time they were identical with the infamous Hyksos pharaohs whose origins have been a bone of contention among Egyptologists for decades. representing the land of Ireland, is shown demure and humbled. of Christianity in Ireland, which consisted of sects like the Orphites. The devastated countries of the North-West were referred to by the ancient Egyptians as the "Dead Lands" or "Lands of Darkness." We find the same motif in Masonic legend, with an emphasis on the east as the center of civilization. This cunning fabrication of history was eventually insinuated into the curiculum of every school, college and history book by duplicitous Masons and their agents contaminated by Atonist-Judaic traditions. It never occurs to moderns that the history of the West has been misrepresented by those who have stolen, cannabalized and inverted every sacred tradition of the Western Elders.